What does the symbol of Sai Baba mean? The logo at the top of this page is the logo of the International Sai Organization. We ask that you respect it and don't use it except for Sai Organization matters. The logo contains the five human values that form the foundation of Bhagavaan Sri Sathya Sai Baba's education-in-human-values program: truth (sathya), righteousness (dharma), peace (santhi), divine love (prema), and nonviolence (ahimsa). 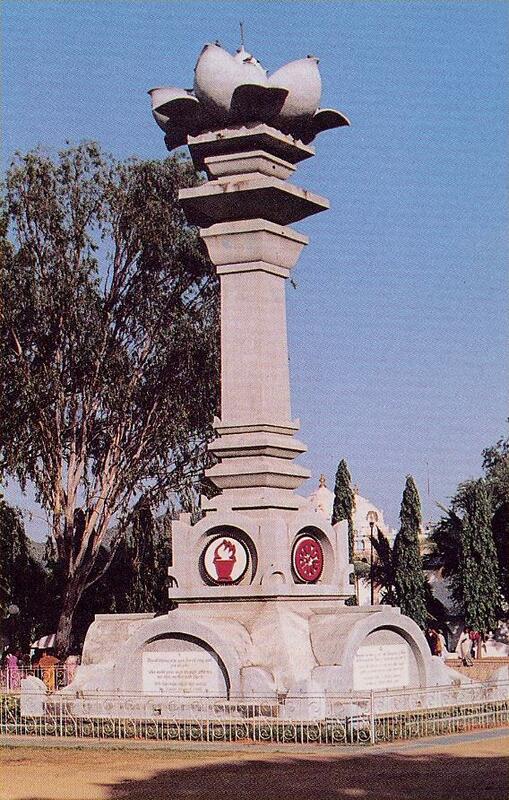 This pillar is near the temple in Prasanthi Nilayam (Sathya Sai Baba's main ashram in India). At its base are symbols of five of the world's major religions, along with the associated sayings shown below. The pillar, with its concentric rings, represents yoga, or Union with God. The rings indicate the stages of yogic discipline required for unfolding the "lotus of the heart", whose petals are at the top of the pillar. The flame of inner illumination is in the center of the lotus. Just as the lotus plant lives in water but does not get contaminated by it, so we should live in the world but be untouched by it. Hindu Om: Listen to the primeval Pranava (Om) resounding in your heart as well as in the heart of the Universe. Buddhist wheel: Remember the wheel of cause and consequence, of deed and destiny, and the wheel of dharma that rights them all. Zoroastrian fire symbol: Offer all bitterness in the sacred fire and emerge grand, great, and godly. Islamic crescent and star: Be like the star, which never wavers from the crescent but is fixed in steady faith. Christian cross: Cut the "I" feeling clean across and let your ego die on the cross, to endow on you Eternity. "Let the different faiths exist, let them flourish, and let the glory of God be sung in all the languages and in a variety of tunes. That should be the Ideal. Respect the differences between the faiths and recognize them as valid as long as they do not extinguish the flame of unity."